Looking for a church in Nottingham? 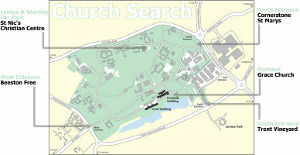 Especially if you're a Fresher, church hunting can be a bit daunting. 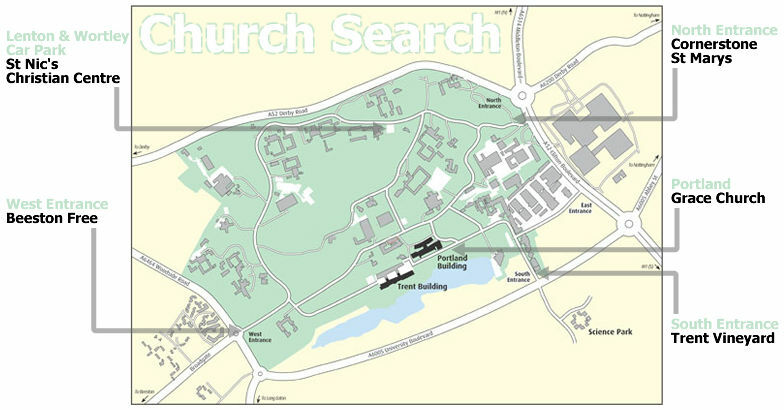 To help you, we've put together 'Church Search'. Below, you'll find a list of churches that many Nottingham CU members are part of. You'll also find a contact from that church (usually a 2nd or 3rd year) who has volunteered to meet and take you to church. They'll show you around, introduce you to people and generally make going to church that bit easier. You can find these people at the place marked on the map, at the times shown below. If you're a Christian and not involved in a church, take a look at why we believe you should be. Sorry, the official 'church search' period has now ended. However, details of many churches can be found below for you to explore.